1960 was the first official Europa CEPT issue and on that occasion 20 countries issued a total of 36 stamps, more than the double of 1959! 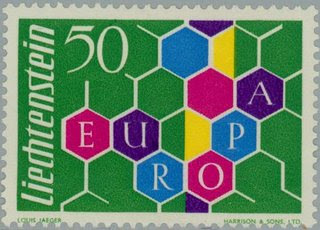 For 11 countries it was their first Europa stamp issue (Denmark, Finland, Great-Britain, Greece, Iceland, Ireland, Liechtenstein, Norway, Portugal, Spain and Sweden). The common design was a Roman mail-coach wheel with 19 spokes designed by the Finnish artist, Pentti Rahikainen. (20 countries; 36 stamps). That year, Liechtenstein issued their first Europa stamp (not with the common design). That issue, only 322'000 stamps, suffered of speculation and became very fast a must because of it's rarity. During the next decade, the number of countries changed year by year, some countries stayed faithful other issued Europa stamps from time to time. 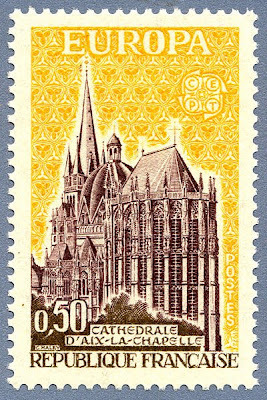 Some smaller European countries issued their first stamps during that period. 1961 new: Cyprus and San Marino. The common design was a stylised dove made up of 19 individual doves designed by the Dutch artist Theo Kurpershoek. (16 countries; 34 stamps), 1962 new: Monaco. The common design was a stylised tree with 19 leaves designed by the Luxembourgian artist Lex Weyer. (18 countries; 39 stamps), 1963, common design a stylised cross, designed by the Norwegian artist Arne Holm. (19 countries; 36 stamps). 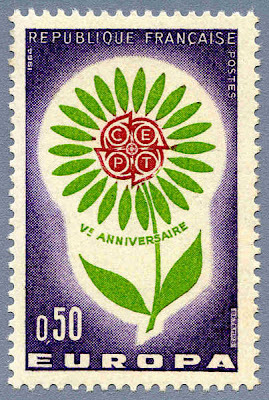 In 1964, for the 5 years of the CEPT, the design was a flower, designed by the French artist Georges Bétemps. (19 countries; 36 stamps). 1965, the design was a tree spring, designed by the Icelandic artist Hördur Karlsson. (19 countries; 36 stamps). The 3 leaves suggested to represent: Posts,Telegraphs & Telephone. 1966 new: Andorra (French post). The design that year was a ship designed by the German artists Gregor and Josef Bender. (19 countries; 37 stamps), In 1967, the common design represented cogwheels designed by the Belgian artist Oscar Bonnevalle. (19 countries; 37 stamps), 1968, the Swiss artist Hans Schwarzenbach designed a key with the CEPT logo in handle. (18 countries; 35 stamps). In 1969 the CEPT celebrate their 10 years anniversary, it was the occasion for many countries to take part again at the Europa stamp issue, that's why we had 26 countries participating that year and 2 new countries the Vatican and Yugoslavia. (26 countries; 48 stamps). Yugoslavia was the first Communist country to take part ! That year the common design was a temple made of the words Europa and CEPT. The design was made by the Italian artists: Luigi Gasbarra and Georgio Belli. 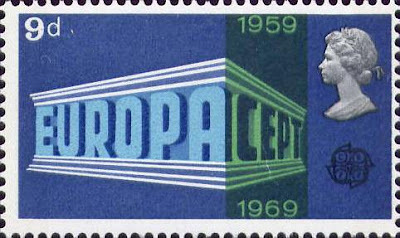 During the Seventies the CEPT felt that the Europa stamps collectors started to get tired of all those similar designs. In 1970 they decided to allow each country to issue one stamp without the common design, thought this new rule wasn't followed by many countries. 1970 a sun composed of 24 interwoven wires designed by the Irish artist Louis Le Brocquy. (19 countries ; 42 stamps), 1971 new: Malta. The design of a chain was made by the Icelandic artist Helgi Haflidasson (21 countries ; 44 stamps). 1972 new: Andorra (Spanish post). Only 200'000 stamps were issued by the Spanish post of Andorra that year and a huge quantity of them were bought, by Spanish philatelist, in order to speculate. The result of it is that this stamp is now more than 200€ worth! The Finnish artist Paavo Huovinen represented an Aurora borealis as common design. (22 countries ; 46 stamps). you are right ! it's Georges Bétemps, not Jacques. I'll correct it, thanks !